We are a company providing best solutions for garage doors in Elk Grove. We only hire qualified and trained professionals to ensure the optimum quality of work. You can get all kinds of installations, replacements, adjustments and repairs to your garage system done by us. We offer 24/7 emergency service. When you have tried the services of other garage door companies but none of them have proven effective, now is time to call us. We know we can give you what you want and need at a price you can afford. We are the most reputable garage door company in the city because of our affordable and effective services. Don’t allow any other service to install or repair your garage door, springs or opener. They may not be as good as our professional technicians are. To always be safe while you use your garage, get the help you need from us. We are proud of the work our service technicians are able to do for you. The two common springs are torsion and extension. They take a beating over time and require servicing. One is used for lightweight doors and the other is utilized for heavier ones. Replacing or repairing these springs is no problem for the experts at our company. The belt, screw, and chain drive are each an opener. Our stock of openers is completely made up of brand names like Sears, Marantec, Liftmaster, Chamberlain and Genie. If you are looking for a cheap opener and don’t care about the noise, the screw drive would be your choice. For an opener that is quiet you will have to pay more and it would be the belt drive. The chain drive seems to be most common. It is moderately cost friendly and the noise will not drive you completely crazy. Adjustments and maintenance should be adhered to regularly. 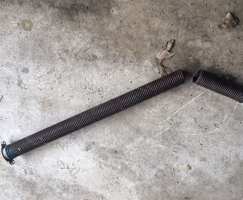 Garage door systems experience wear and tear just like any other mechanical products. A little preventive maintenance can definitely go a long way. Just a little bolt tightening and lubrication can keep you from paying more money down the road. We offer an extensive preventive maintenance program just for you. The remote is often overlooked for a product that makes our life so much easier. 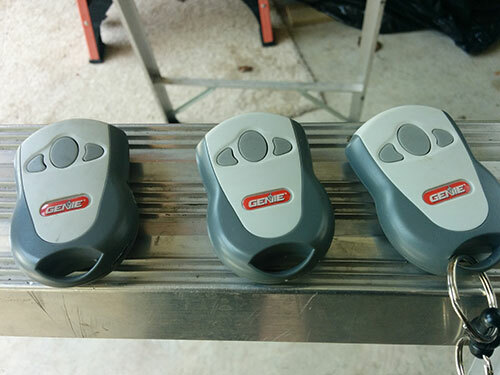 With a remote we can operate our garage easily and confidently. We carry only products that our customers can trust like Liftmaster Security, Genie Intellicode, Multicode and Clicker. Sensors are an ingenious part of the garage system. They ensure that the door opening and closing procedure goes as expected. In addition, if there is sitting on the garage door track the door will not be permitted to close until the object is removed. This is a very important safety precaution and it is made possible by the photo eye, safety, and infrared sensors located on the garage door system. 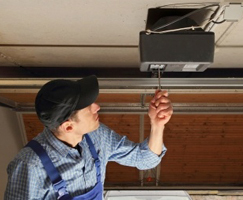 Installation and Replacement services are sought often by garage door owners. When this happens they want a garage door company they can count on. They turn to us. No matter what type of door you have at your garage, we can handle it. In addition, we can tackle those windows that are broken and damaged door sections. Our specialists also service tracks and cables. Cables take a beating as well and will often get loose or break. It is not unusual to suffer from damaged tracks as well. We can solve these problems for you. “Garage Door Repair Elk Grove" offers a great variety of garage door system products and high-quality gadgets, including maintenance, opener repair, door Installation, Door substitution of springs, Door segment sheet maintenance, embellishment and altercation.